Hi David, tell us who you are and what lead you into microservices? I started at elastic, the company behind elasticsearch and friends, more than 5 years ago. I moved recently to an evangelist position as I’m more now a speaker than a developer. While going to conferences, I can see that microservices are becoming more and more popular which made me think that I should definitely share my knowledge about monitoring that kind of platform. I’ve seen in the last years how much the stack we are building can solve many different use cases as soon as you have data somewhere. Which is typically the case with logs and metrics generated by microservices. Centralizing all the information of all microservices in elastic stack will definitely help dev/ops to understand what is happening. 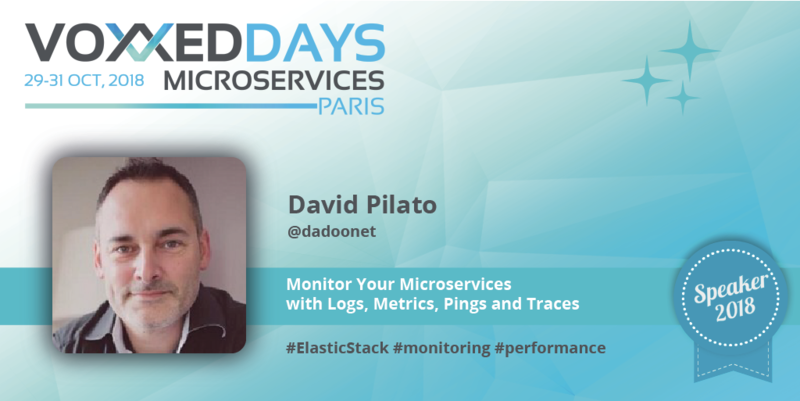 I’ll introduce the open source elastic stack and will demo how you can use it to effectively monitor running microservices by using logs, system and application metrics, health and application performance monitoring. With Microservices, monitoring is mandatory. What patterns do you see in the industry: projects moving to microservices and then monitoring them, or projects that first put monitoring in place and then move to microservices ? Well. It depends as always. I’ve seen people who started to monitor their “monoliths” with the elastic stack. When they are moving to a microservice architecture, monitoring is part of the design from the beginning then. And sometimes you see people trying to build a Minimum Viable Product without any time to invest in their monitoring (or something really minimal) but then, when the popularity grows, they can see some latency in the service they are proposing. It becomes then obvious that having monitoring is the key to understand what are the key pieces involved in the slowness. My advice would be to start every new project with monitoring from the beginning as nowadays, adding elastic stack is super fast and the value is immediate. Sure! I’m yet excited to speak at Voxxed Days Microservices in Paris and share with attendees all what I know about this field.